While WTF concrete forms can be used for an infinite number of concrete applications, the following systems are areas WTF has received industry recognition as the world leader. As the premier manufacturer and distributor of concrete formwork products, Wall-Ties & Forms has developed the Concrete Foundation System for contractors specializing in concrete foundation work. Regardless of the application, from simple structures to the most complex custom homes, our Concrete Foundation System will meet your needs. The WTF Crawl Space System is designed to suit the customers requirements. Specially designed system for integrated wall and footing construction is one of our latest innovations. The systems allows for the monolithic concreting of footings and walls. SecureTech's state-of-the-art concrete housing construction technology allows the contractor utilizing WTF components (commercial forms, ledger system, deck system, and insulation system) to create a monolithic concrete structure that is unsurpassed in energy efficiency and strength. With the demand for well-constructed, affordable housing at an all-time high, our International Aluminum Forming System provides low cost construction and rapid completion of residential or commercial, single or multi-level structures. WTF has designed Post & Beam Systems for many applications in the International and Domestic markets. Our Post and Beam Forms are optimally designed to produce variable concrete sections, keeping concrete forming costs to a minimum. WTF has been custom designing pool forms since 1980. Our Swim-crete Swimming Pool Systems are designed with the pool dealers in mind. We are sure one of these systems will meet your pool building needs, whether it be vinyl liner, all concrete pool construction, or both. Visit the Swim-crete website for full product information. Wall-Ties & Forms has served the agricultural community for two decades and our commitment to providing the best concrete forming system grows each year. WTF's innovative design, long lasting products, ease of setup and speed of construction assure that you won't be confined by inferior or restrictive products. With over 20 years of providing concrete form solutions for precast professionals WTF Precast Form Systems are ideal for many precast challenges. WTF lightweight modular concrete forms can create an infinite number of size and shaped precast concrete structures including but not limited to the following. WTF Fence System is designed for ease of use with minimal maintenance. Our systems offer flexibility and a wide variety of designs. Facesheets are available in smooth, smooth brick, textured brick and vertibrick designs. Walls are designed to integrate with columns, column spacings are adjustable with the use of fillers. The WTF Safe Room System incorporates wall, ledger and deck forms to create the desired size of safe room which enables the contractor to pour a monolithic structure that meets FEMA guidelines. This system was designed to meet contractor specifications. 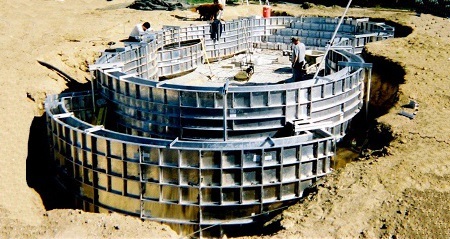 From round column forms to adjustable rectangle column forms, WTF can produce concrete forms to fit your column forming needs. Concrete forming system for multiple story burial chambers in the Philippines. Designed to minimize the use of ties.